For many homeowners on a budget, the objective of home improvement is to get maximum results with minimal investment. How can you spend a little to get a lot in both value and utility? The answer is frameless glass shower doors. Even if you don’t do anything else to improve your home, replacing your current shower curtains or sliding glass doors with a frameless glass shower door will offer huge benefits without breaking the bank. Some home improvement projects can cost a fortune and will offer only minimal benefits. An addition to your home, or even a complete bathroom renovation, can require homeowners to dig deep into their savings or even take out a second mortgage. But frameless glass shower doors are a home improvement your family can use right away and get maximum value from when you finally sell your home, even if that is many years away. 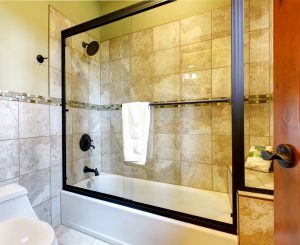 In many cases, homeowners are able to recoup the cost of their frameless glass shower doors in the added value they give to their home — something that isn’t always possible with home additions or room renovations. Stylish, attractive, and useful, frameless glass shower doors offer a fast and easy way to get the most out of your home improvement investment. Plus, frameless glass shower doors are a home improvement your family can enjoy and use every day. They make your daily shower more enjoyable while giving your bathroom a chic and modern look. So if you are going to do only one thing to improve the look and usefulness of your home, consider adding frameless shower doors to your bathroom. They offer maximum value and enjoyment with just a relatively small investment compared to other home improvement projects.